This is my new film Strange Past! A couple years ago my wife Maggie Lehrman was on a writing retreat and emailed me this screenplay she had written for me to direct. 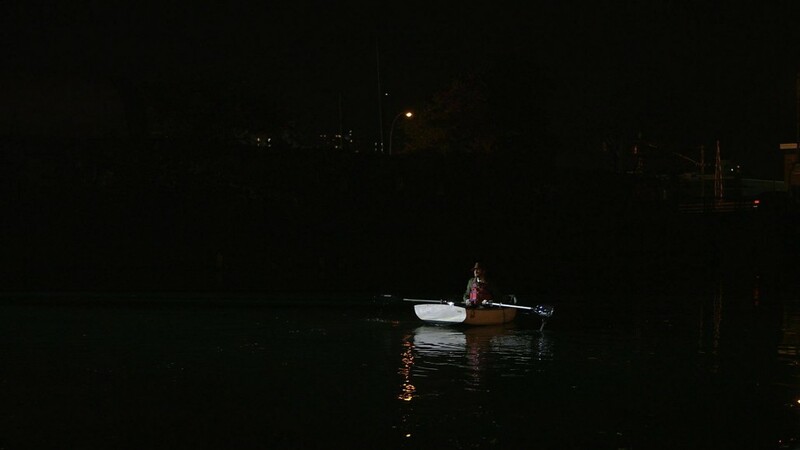 I loved it, but it has a very important scene involving a boat on the Gowanus Canal, one of the most polluted waterways in the United States. When I write for myself I always imagine how hard it would be to shoot, and I would never write that scene. But it was way too cool to cut out. Thanks to my old friend/sailor Randy Bell and Owen Foote from the Gowanus Dredgers canoe club, we got a boat on that canal and it looks amazing. These days I am very happy editing funny TV shows and not directing movies. I assembled a whole new team in front of and behind the camera because I wanted a totally new challenge. I brought in Laura Elizabeth Wood to help me produce, recent AFI grad Stefan Weinberger on camera, and longtime Hal Hartley co-conspirator Richard Sylvarnes handled production design. The actors are a bunch of pros. I first saw Lauren Lim Jackson in a play with Maggie in college and she is frequently a dancer on Broadway. Jill Durso was my student when I was a teaching assistant. She’s an Emmy-winning producer and has recently started acting. Dan Cozzens had a large role in the start of my relationship with Maggie and acts in all kinds of experimental theater. Will Reynolds went to high school with Maggie and has been in a number of high profile off-Broadway shows. Joel Perez is a friend of a friend who was a very welcome addition to our group, and can now be seen in Fun Home on Broadway. Kyle Gilman is usually an editor, but I thought it would be easy to act again since the role of Jack is mostly just standing and watching. Since I’d be doing that behind the camera anyway, I assumed I could just stand in front of the camera and it would work just as well. Let me write this down here to remind myself. It’s not possible to watch yourself act. Unless you have a lot of extra time in the schedule for playback, you really need to cast someone else, because the directing suffers. I had to edit Maron season 2 and Ned Rifle before I could really take the time to edit Strange Past. I think it was a big help because it allowed me to get enough distance from the material. I was a different person when I directed the film. After almost a year I was able to see the things that worked rather than thinking it was all garbage. Strange Past premiered at the Monadnock International Film Festival in April 2015 and I had a fantastic time there. I got tired of waiting for the rest of the festival process so I’m posting the film online for everyone to see. Festivals are fine, but I really just want people to see the film. I hope you enjoy it.